Adding Fringe : Beading Patterns and kits by Dragon!, The art of beading. Adding Fringe to a bag! Here's a quick tip on making your fringe tight. Hold on to the skipped bead while pulling the thread through! You never want the fringe too tight, so roll the fringe between your fingers after adding each row! 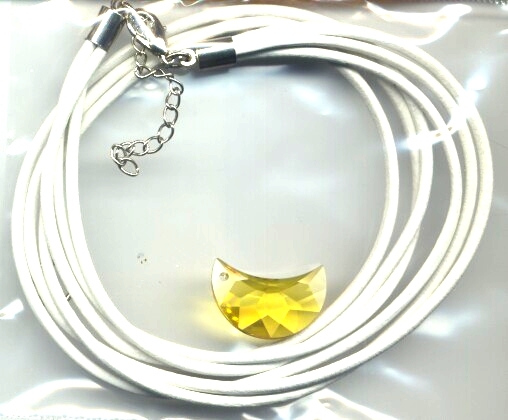 Add 1 white, 1 s/l-white, 1 tulip bead, and 1 amethyst bead. Skipping the last amethyst bead, go back through the tulip bead, all the other beads just added, and the next bead on the fringe hinge. Pull snug. Add 1 white, and 1 amethyst bead. Skipping the last amethyst bead, go back through the white bead just added. Go through the white bead you came out of and the one next to it. Pull snug. Add 2 white and 1 amethyst. Skipping the last amethyst bead, go back through all the other beads just added. Go through the white bead you came out of and the one next to it. Pull snug. Add 1 white, 1 s/l-white, 1 white, and 1 amethyst. 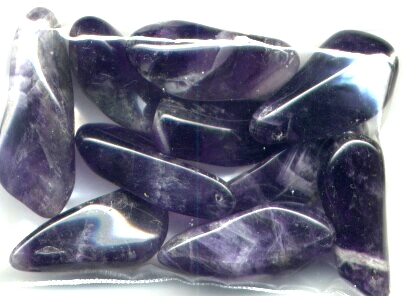 Skipping the last amethyst bead, go back through all the other beads just added. Go through the white bead you came out of and the one next to it. Pull snug. Pdf file! It's Free to print the printable pages! Sometimes when you add fringe and pull it tight, it seems okay and then later it loosens up. That happens because some of the thread is caught up in the beads and you can't see it. Then later on the thread untangles and your fringe will loosen. So if you have had problems with that in the past, this is a good tip. After you have added a row of fringe check for these things! Is there any space between the row of fringe beads and the beads in the band (seed or bugle)? 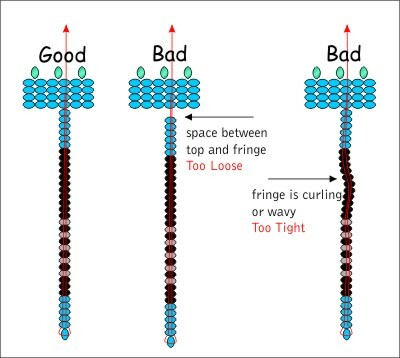 Is there any curling or wavy parts in the fringe row? If so, now is the time to fix it before you move on to the next row. I do this constantly, with every row, just to make a nice smooth piece. After you add the row of beads and pull it tight, hold the bottom bead and loosen the row just a smidgen, and tighten it again, while holding the bottom bead. Sometimes I will do this more than once if the fringe is being stubborn. Adjusting Fringe when you have different sized beads! Let's say that you have this pattern! But the beads you have are not all the same size. a big difference until you are on the 5th row. the same size and the Pink beads are a bigger size. 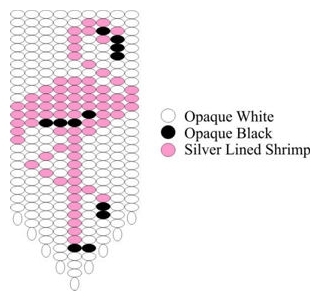 the black beads don't line up in the middle like in the original bead graph. (pic 1) is done with the big pink beads with no corrections. I've outlined the beads in Blue that I would remove to make it line up better. (pic 2) I've outlined the beads that I would add to make the rest of the pattern line up. same size and the Pink beads are a smaller size. (pic 1) is done with the small pink beads with no corrections. (pic 2) I've outlined the beads that I would add to make the pattern line up. This is not always easy and not for everyone. As you can see, they all still look like flamingos. But there are a lot of beaders that want a little more perfection. How do you know when to add or subtract beads. First if the beads are bigger, it is most likely that you will need to remove a few on long sections of that same bead. 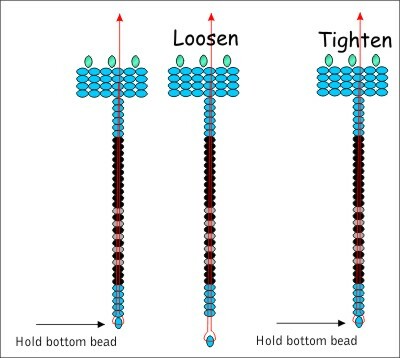 If you have smaller beads and a long section of that same bead, you will most likely need to add in a few beads. Whenever I do fringe or strand work where I want the lines to match up for a picture, I check my design about every 20 beads to make sure the pattern is lining up like the original bead graph. These pages are just here to help out! The instructions show you how to do different types of stitches.